Igor Caragodin combs out the neck collar of the condor mount currently on display at the MAC. When Scottish naturalist David Douglas arrived in the Northwest in 1825, one of the first creatures he searched for was the bird we now call the California condor. Douglas knew that the Corps of Discovery had delivered a skin of this huge carrion-eater back to Philadelphia, and he was eager both to observe the bird’s behavior and procure a specimen for British science. Condors never mixed well with white settlers, and after Douglas’ time, the beautiful buzzards went into a precipitous decline. The last documented record in the state of Washington was of an adult on the ground at Grand Coulee in 1899 — perhaps following a salmon run. The last mention from the state of Oregon was submitted when a father-and-son ornithologist team spotted two flying condors in the Umpqua hills during the winter of 1902. Like Douglas, they shot at the birds and missed. 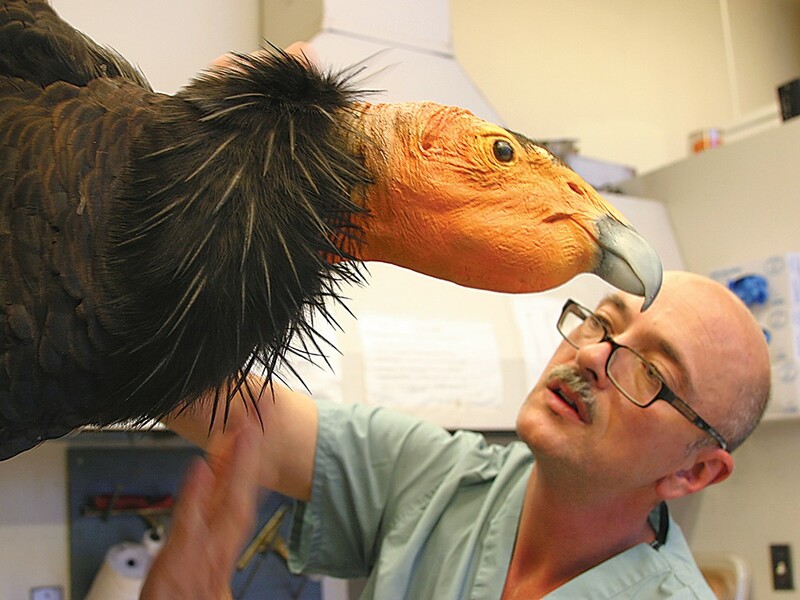 Since the 1980s, when the final few California condors living in the wild were captured and kept alive at the San Diego Zoo, a captive breeding and release program has proved unevenly successful in California and the American Southwest. There has even been preliminary discussion about releasing condors back into the lower Columbia, where Douglas tracked them so diligently two centuries ago. When the Northwest Museum of Arts and Culture (MAC) decided to undertake a David Douglas exhibit a few years ago, this background led to talk of somehow including a condor presence in the show. Rob Faucett, ornithology collection manager at the University of Washington’s Burke Museum, performed clerical miracles to obtain the carcass of one of the captive release birds that had died of lead poisoning in the wild. As the Burke’s first adult condor carcass worked its way through a maze of Fish and Wildlife paperwork, Faucett called a taxidermist named Igor Caragodin to ask if he might want to tackle a large-scale project. Caragodin was born in the republic of Moldova, now an independent state located between Romania and Ukraine. A boyhood visit to a nature museum led to a houseful of snakes, rats, lizards and small birds, and by age 14, he had tried his hand at stuffing a great chickadee. In time Caragodin earned a master’s degree in ornithology (the study of birds) from the University of Kishinev, where he worked as a bird collector and preparator. In 1988 he moved to Russia’s State Darwin Museum of Natural History in Moscow, where in association with the Burke Museum he honed his skills. In 1998 Caragodin relocated to California, where today he operates a taxidermy service for museums, universities and outdoorsmen. He maintained his association with the Burke, creating a stunning wandering albatross mount for Faucett in 2008, and agreed reluctantly to try his hand at the frozen condor. Igor had worked with African vultures, and knew that compared to the albatross’ dense plumage, tight skin structure and sleek body shape, carrion eaters had loose, fuzzy feathers and dumpy bodies. But he said yes. A meticulous researcher, Caragodin prepared for his task by combing through archives for information about small details such as condor plumage succession and beak, head, and foot color in different age classes. He studied every photo and video he could find on the Internet. At the first opportunity, he traveled to the Grand Canyon to watch the flight mechanics of successfully released birds. What Caragodin could not prepare for was damage done to the condor body tapped for the Douglas exhibit. Lab analysts had chopped the bird’s head and neck to pieces, and also removed large chunks of muscle around the breast and crop, near the throat. He had to spend many hours sculpting clay to fashion a body shape before facing the aesthetic considerations that would bring the bird back to life. To create a secure mount in a realistic posture, Caragodin welded a threaded bolt into the back of his sculpted body. He draped the skin around this base like a cloak and sewed it closed with tiny invisible stitches. He airbrushed a conservative shade of orange-red onto the naked head. He bandaged the wings and feet into a dramatic turning position, then carefully combed out all the loose feathers right down to the distinctive neck ruff. After a nerve-racking month to make sure the creation was completely dry, his condor mount (along with his classic wandering albatross) arrived in Spokane just in time for the opening of the MAC’s David Douglas exhibit. There, the beautiful buzzard of the Columbia soars again. Jack Nisbet curated the “David Douglas: A Naturalist at Work” exhibit, which continues its run at the MAC through Aug. 24. The exhibit then travels to Tacoma and reopens at the Washington History Museum.